Lobelia valida is a rare plant from the cape floral kingdom in South Africa. It has fleshy stems and leaves and forms a nice clump 40-60cm high. 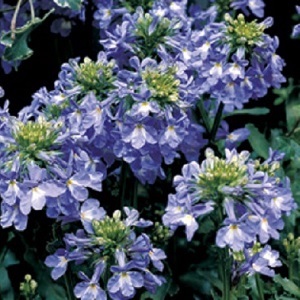 Large heads of extremely showy true blue flowers appear throughout the summer. This is a highly sought after flower colour and makes a strong impression in the garden. Kew describes this plant as a "superb perennial”. Lobelia valida prefers a sunny or part sunny spot and well drained, composted and slightly alkaline soil. It can tolerate coastal gardens. Pack of 20 small seeds. Sow anytime. Sowing instructions and a colour photo are printed on the packet. Sow Sow anytime, typically spring to autumn. Sow in a tray of moist seed compost and cover lightly with compost. Germination takes 3-4 weeks at room temperature. Pot on seedlings when they are big enough to handle (they grow slowly) and plant out in the garden after the last frost. Pinch out the tips of young plants to encourage a bushy habit. Protect from harsh frosts with mulch on the roots. Grow in a warm garden. Grow Plants are evergreen. They do not need cutting back – just trim back lightly after flowering. Older plants can get a bit woody – plan to replace plants every 3-4 years. If sown in autumn or early spring, these plants can be grown as annuals, as they will flower in the first year.